I really like postcards. I like the way they represent a place without necessarily being anything like its day to day reality. They seem optimistic somehow. I don’t much like writing them – I tend to restrict myself to a few words and a good deal of flippancy – so can’t really claim to like sending them with any degree of conviction, but I like getting them (and if they arrive back ages after the sender so much the better, especially if they’ve followed a convoluted route) so I send them in the hope that their recipients might enjoy them in much the same way as me. When I choose postcards I aim for maximum cheesiness, as long as it’s authentic (whatever that means) – there is no place for knowing postmodern pastiche here – and often choose cards featuring photographs that aren’t exactly recent. Doubtless a good few artists have worked with postcards but two of the examples that have stayed with me as works I’ve particularly enjoyed are ones I first saw in the Venice Biennale (one in 2009, the second two years later). And, since I’m in Venice this weekend for too short a visit to warrant sending any postcards, I thought I’d write about them here in the form of one of those memorable works. 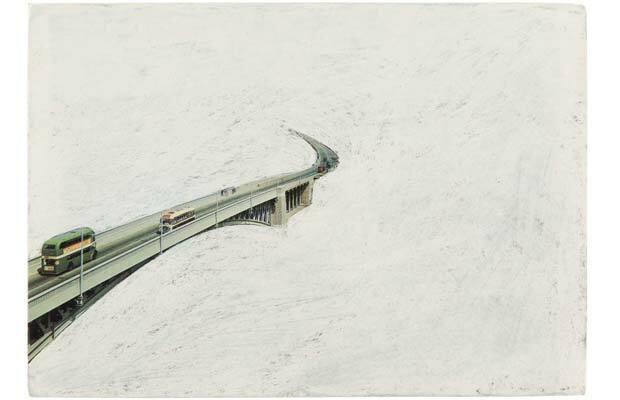 Tim Davies’s series Bridges interests me for several reasons. Firstly, bridges themselves are often fascinating structures. A long time ago, before I went to art school, I made a series of photographs of bridges across the Thames which made me look at them – a lot – and started an interest in both their formal, architectural qualities and in their function: the connecting of two places, as ways to get over an obstacle (water, traffic etc). For this series, Tim Davies collected postcards that feature bridges and sanded out everything else from the image. The bridges become odd, abstract shapes, without the context of the lndsce they usually inhabit. The scratchiness of the sanded surface is oddly pleasing and somehow works rather better here than painting out would have done; the bridges’ surroundings have been removed rather than veiled. The composition of the photographs has been destroyed but the positioning of this one element from the scene is fascinating; in some, it’s clearly a minor feature of the image, in others it must play a more significant role. When there is traffic on the bridge, we get a feeling for the age of the image; when there is nothing on the bridge we are left with little to go on. One of the things I particularly like about this series is the sheer scale of the piece. 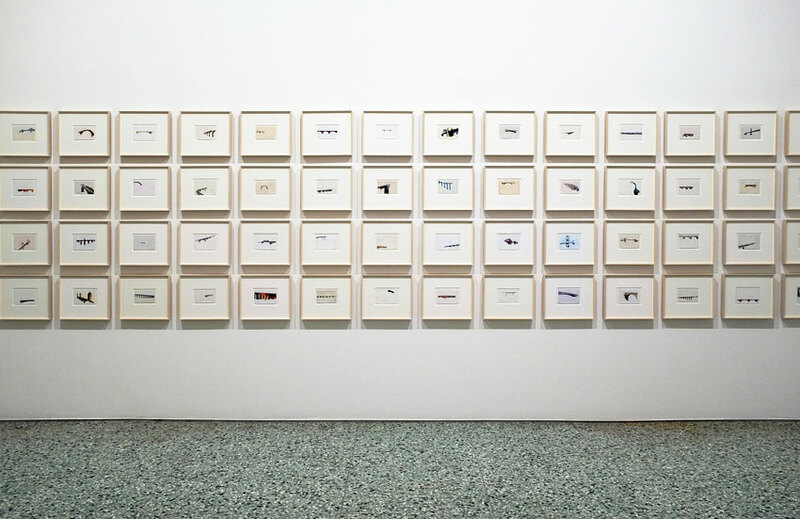 Though made up of standard 6″x4″ postcards, the series occupies a large wall. So many bridges (60 in all). And all different. 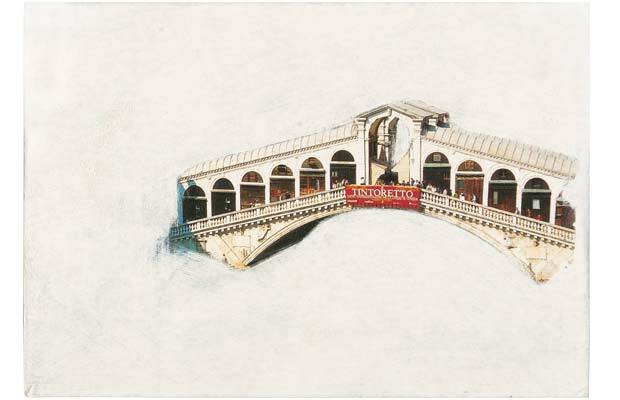 Just like Venice, which features in one of the cards (at least) in the highly recognisable form of the Rialto Bridge. In Davies’s Venice exhibition, this piece formed a bridge between two works referring to Wales and the place of Welsh service personnel in the British armed forces and two works that referred to Venice. Though the audio elements of two of the video works splilt into this space – emphasising the way that it connected the other works – it nonetheless felt separate and offered a brief moment of pause. Tim Davies represented Wales in an official collateral event at the 54th Venice Biennale in 2011. This entry was posted in Photography and tagged art, Bridges, mixed-media, photography, postcards, Tim Davies, Venice, Wales by Ann Jones. Bookmark the permalink.